I never used to have much seafood in my diet while I was living in Germany, apart from the occasional fillet of salmon, herring, trout or tin of tuna. Only when I went to South Africa and subsequently to Dubai, I was introduced to shellfish. Ever since I have enjoyed prawns and clams as often as I could. They always make a full and yet light meal, perfect for Dubai summers and for cooler temperatures anyway. Here is my favorite clam recipe, always eaten with fresh baguette bread to be dipped in the tomato sauce. 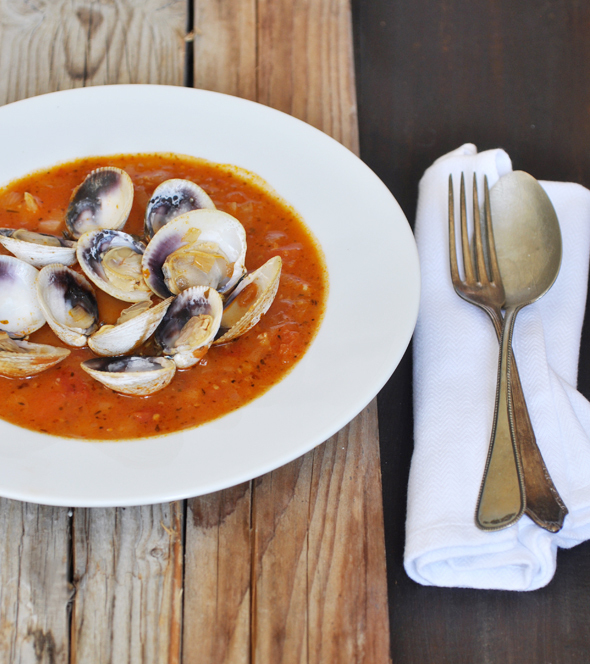 Keep the raw clams in cold water for a few hours or half a day to rinse out the sand. Heat the oil in a pan. Cut the onions into fine rings and fry them until soft, about 5 minutes. Add crushed garlic and fry for another minute. Add chopped tomatoes to pan. Add tomato paste, salt, herbs and white wine and bring to boil. Cover with lid and simmer on low heat for about 15-20 minutes. Stir in the washed clams and cook for another 10-15 minutes. This dish is better when made in advance and heated up. Just before serving, add the cream/milk to the dish to make the sauce smooth. Serve with fresh bread.